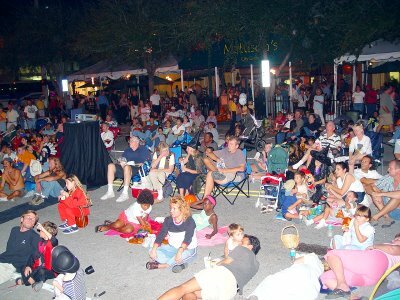 The Main Street Merchants Association along with some local community groups, like Movies & Shakers, put on a fun family event in Downtown Sarasota in October. 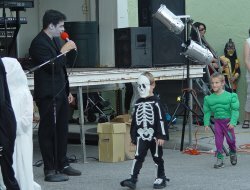 Called Franken-Fest, the event included trick-or-treat for the kids with participating Main Street merchants, a costume contest for the kids, a showing of the classic Mel Brooks comedy "Young Frankenstein" and live music. All of the children taking part in the costume parade received a free pumpkin courtesy of The Gator Club. Downtown Sarasota restaurant Relish This Hot Dog Bistro served food and Paul Mattison of Mattison's Main St. Bistro along with Ernie Ritz of The Gator Club supported and organized the event. Proceeds from food sales were to be donated to the All Faiths Food Bank. 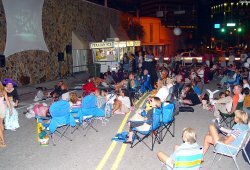 The event was to be a benefit for the non-profit community group Movies & Shakers who generously allowed the All Faiths Food Bank to receive the money raised after their Keep on Truckin' fundraising event was rained out in September. Click on the arrows at either end to scroll through the pictures. Click a small picture to see the larger version.